My co-founder Kaleb and I started Ethos with one goal in mind: help the tech companies we spent our careers supporting grow and thrive by investing meaningfully in their employees. Today, we are proud to announce the website is live, the company is launched, and we are officially open for business. At Ethos, we drive company performance by shaping talent and developing culture, always with growth in mind. While we plan to launch many offerings to achieve this mission, we’re starting out with resources that help tech companies hire the right talent, retain that talent longer, and bring in diversity practices that spur greater innovation. We want to be part of your growth story, so without further ado, here’s what you need to know about us. We take our name very seriously because it completely encapsulates all that we do. Ethos means “the characteristic spirit of a culture, era, or community as manifested by its beliefs and aspirations.” It’s synonymous with essence, value systems, and principles. But ethos has another meaning, one rooted in argument and persuasion. It’s often characterized as an appeal to ethics, and as a style of debate, one that relies on expertise and credibility. We’re dedicated to working with tech companies to create their cultures, value systems, and communities according to their own unique set of ideas and goals — their ethos — with our own evidence-based approach, deeply rooted in our singular understanding of talent and tech. Ultimately, we commit ourselves to making every culture healthy and purpose-driven. We help grow companies by setting a vision and establishing practices that give purpose to the individuals who make them up while still serving the bottom line. People make or break companies; we’re in the business of turning every team member into a positive change-maker. To accomplish this mission, we have four core tools at our disposal: diversity, hiring practices, vision and values, and career pathing. 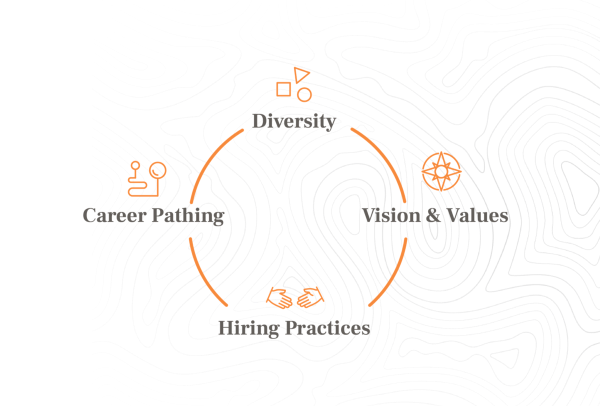 As a new company focused on driving impact for the companies we care about most, we’re launching our diversity and hiring practices services first. Here’s what you need to know. Companies that are diverse are 35% more profitable than ones that are not. To generate the largest marketplace of ideas within an organization and truly innovate, more unique perspectives need to be heard. This is especially true in tech, where the competitive advantage stems from innovation. We partner with you to understand your business objectives, success metrics, and current team composition. We evaluate your existing diversity efforts and goals, and we compile all the data necessary to analyze both what’s working and what gaps need to be filled. Once we complete that diversity assessment, we create an action plan around diversity complete with short-term, mid-term, and long-term strategies specific to your company’s goals and resources. No matter what, we provide you with an assessment and action plan, both of which you can use for your own implementation. However, as true partners, we can also implement the diversity action plan for you. 30% of your new hires will leave in the first six months, and 17% in just the first three. And, as a tech company, you’re dealing with some of the shortest tenures across industries: employees stay for 1 to 2 years. But you can avoid this cycle of hiring and rehiring; all you have to do is hire the right people and onboard them appropriately. At Ethos, we design interviews, train your employees on how to conduct them, and craft scorecards to make sure you bring the absolute best people onto your team. Once they join, we craft a full 90-day onboarding plan for them, completely structured around your company’s goals. As with all our offerings, we build and deliver customized frameworks for you so you have the option to implement them yourself, but we always offer implementation to those who need it. We’re radically transparent about our approaches to interviewing and onboarding, and we encourage you to look at the frameworks we use. So, are you ready to shape your team’s collective genius and truly invest in your people?